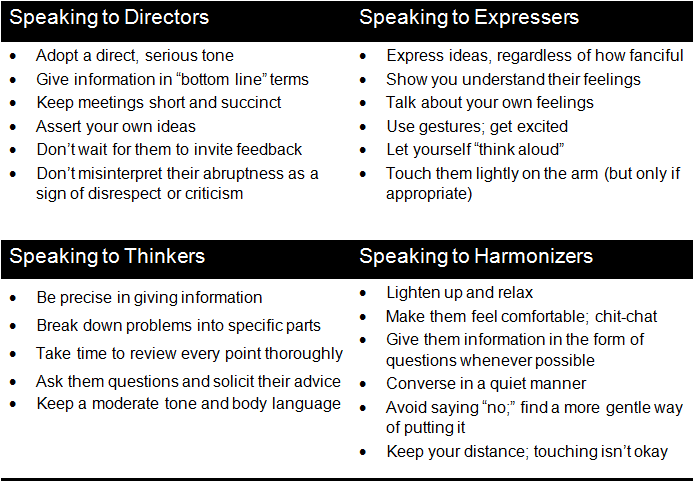 Here are 10 Straight Talk communication styles images drawn from our blog posts. Research shows us people have four different styles of communicating. 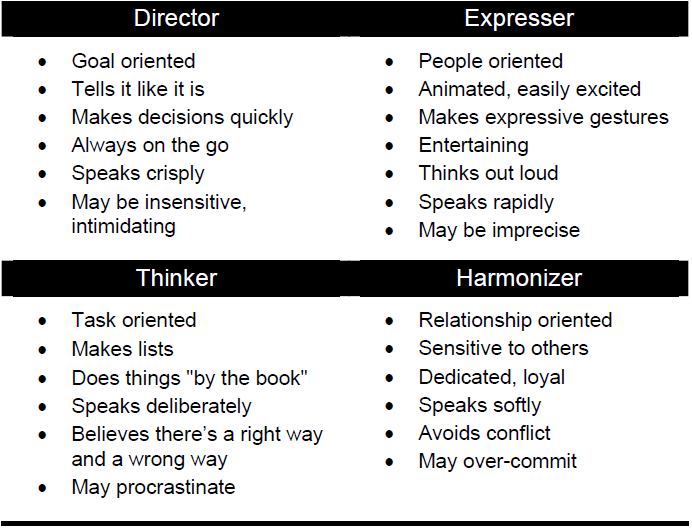 We call these styles: Director, Expresser, Thinker and Harmonizer. Each style has its own way of seeing the world. Each favors a certain way of listening, responding, making decisions, and solving problems. 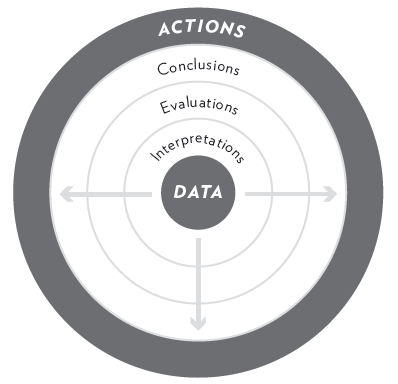 Key characteristics of each style are shown in the chart below. ​​​​​​​Circle each behavior that applies, then total the number of squares you circled in each column. 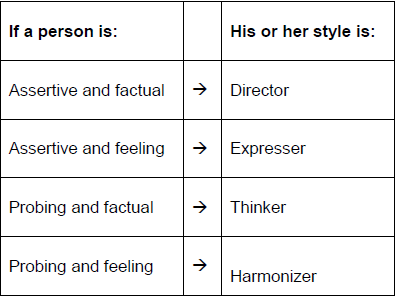 The two columns that get the highest scores will tell you that person’s preferred styles of communicating. Once you’ve circled two styles at the bottom of the chart, use the next chart to determine a person’s primary style. The Matrix of Communication Styles can be somewhat confusing at first, but it’s a very useful tool once you understand how it works. In fact, once you instill in your mind a mental image of the Matrix, you can use it to identify another person’s communication style, even if he or she hasn’t taken the communication styles survey. 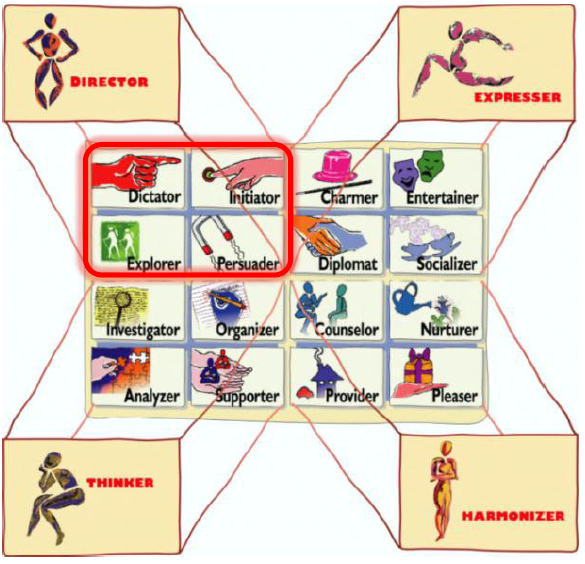 If you split the Matrix into equal quarters, or quadrants, then each quadrant illustrates a primary style—Director, Expresser, Thinker, or Harmonizer. Each quadrant contains four more squares. Your secondary style determines your particular square within each quadrant. Take the survey to discover your style! The combined workings of filters and frames – both of which occur within our subconscious – help us define the four basic styles of communicating. Some people set their filters so that more attention is placed on facts; some set them to allow more feelings to come through. Some people set their frames so that their responses are more assertive; some set their frames so that they respond with questions. This is not to say that the only thing that distinguishes Directors from Expressers is that one filters for facts and the other for feelings. 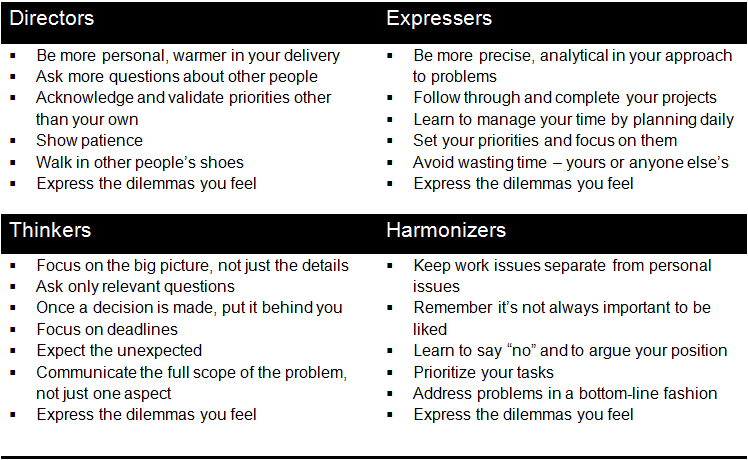 The behaviors of each communication style are more complex and varied than that. 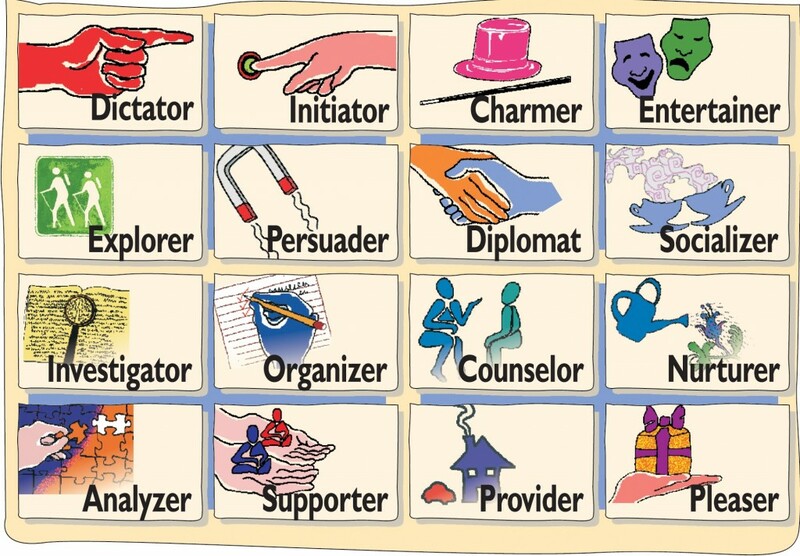 But certain behaviors are “markers” for each style, and these markers can help us identify a person’s style. You can “flex” other styles as you would a muscle. The more you practice flexing different styles in communication with others, the stronger a communicator you become. Some people find adopting a different style to be unnatural. And it can be. The trick is to act yourself into a way of believing. By adopting the body language, style of speaking, and mannerisms of a particular style, you will find it less of a stretch than you think. The Greek philosopher Aristotle espoused a simple philosophy of life. “All things in moderation,” he said. Being too courageous meant you were foolhardy. Being too talkative, you were a gossip. If you were too quiet, you were a recluse. The best course lay in the center. The Matrix has a law of the center, too. If you need to communicate frequently with many different styles, then it helps to modify your style toward the center of the Matrix. The Rule of the Center is simply a formula for being successful in many different settings with many different people. Is your goal to deal with a tough, multifaceted issue? Or is to exchange information? Is it a “get to know you” meeting? Or are you looking for creative input? These different goals each require a different type of meeting, and a different style of communication. 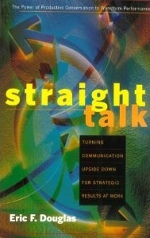 As you might guess, different styles of communicating work best in each type of meeting. This point has an important corollary: Each style prefers a certain type of meeting. Read more in the post Setting Ground Rules. 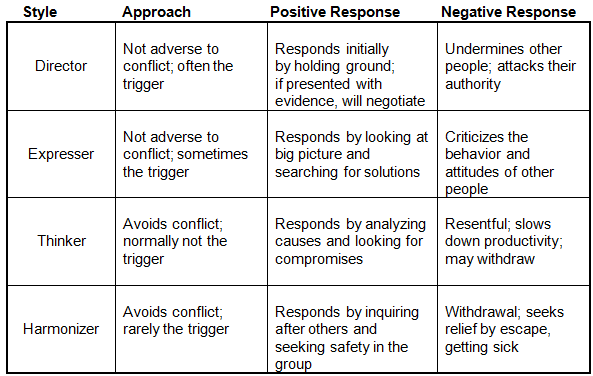 Each style has certain “triggers” that spark them to react in negative ways. Directors are triggered by the perception that their authority has been reduced. Expressers, it’s feeling that their ideas aren’t valued. Thinkers, it’s thinking that procedures aren’t followed. Harmonizers, it’s thinking that other people’s feelings aren’t considered. Knowing how to achieve a balance of styles is a sign of mature management. But the reverse occurs more frequently. The boss selects subordinates who are similar in style to his own; key managers reinforce behaviors they’re comfortable with, rather than those that might provide the necessary balance.